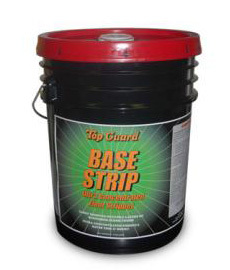 TOP GUARD BASE STRIP is an ultra concentrated floor coating emulsifier that easily cuts through multiple layers of burnished floor finish. BASE STRIP is the fastest working liquefier on the market. Low foaming, no scrub and no rinse features make this product a must for all professional floor care systems. No dye or color added. 33% less Stripper - Less product introduced into environment. Works 75% faster - Less exposure for workers. Super fast liquification of wax or finish. Use for any type of wax or finish - Even the worst buildup. The Top Guard environmental responsibility "Green with Less" program is centered on the introduction of less product to the environment. Base Strip's highly concentrated formula gives you identical productivity with 33% less product and no additional time or labor. Using Top Guard with Base Shield and Base Strip can extend the life of the floor finish in excess of 3 years before stripping. That means less floor finish, less stripping, and less environmental impact. Green with Less!